Before I show you the 11th task from this challenge, I'd like to take a moment to welcome my new followers. I have quite a few new readers these last few weeks and I am so very grateful!! Humbled to have every one of you (old and new) reading. Thank you! OK, now onto Day 11: Household item. I scoured my house for days trying to find something and some way to paint my nails that was going to be new to the nail art world. I *might* have come up with something. Not a new design, but a new way to do it. My "household item" with thinned out nail polish in it! Ciate Cream Soda and Stiletto. Yes, my ribbon untied. I used 3 coats of Cream soda and the thinned out Stiletto and NO top coat. 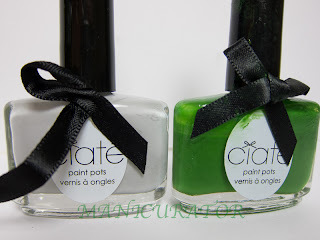 These polishes have a great formula and dry so shiny. 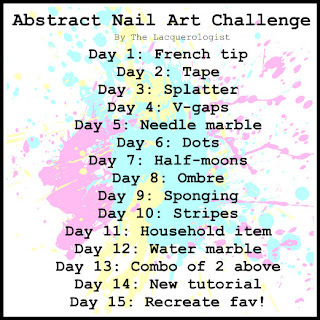 Look for Day 12 from this challenge on Saturday and please check out what the other lovely ladies came up with! Wow this new technique might be a hit, you know? The splatter effect is really cool, and it seems much easier that the classic technique! I might need to try that sometime; and I don't really bother about having to use a lot of polish, we never see the end of a bottle anyways! Does the thinned polish keep well in the spray bottle? I really wanna try this, looks so simple and fun! Amazing! Great work and very clever use of a sprayer! thats a great idea about acrylic paints, they are cheaper and I have a ton on hand! I think I will try this out! I just tried :P It works! At least with my acrylic paints. It takes a while to dry though and the drops tend to move a little bit. Well, that's the water. Wait.....are you calling me and "old" reader??? LOL. OMG this looks amazing! Fantastic idea! Great idea! Love how this came out...less "perfect" it is the better! I love this!! so much simpler than the original way!! Now I am going to try the splatter :) Thanks for posting! That is such a good a idea! Way easier!. This is such a cool idea! I can't wait to try it one day! First, that green is gorgeous and is so striking against the white. Second, how clever are you?! What a fantastic idea, and the results look amazing! I do like how the middle finger has more green; it's a subtle but lovely accent. I love the color combo and the technique is genius! I have wanted to try a splatter mani and I think I will try this technique first. I love the result! 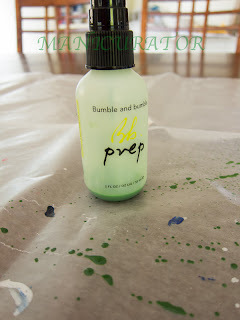 really pretty, never thought of using a spray bottle! This is so amazing!! I have done a splatter mani before but I like the way this looks so much better! Gorgeous, thanks for sharing the technique! I LOVE the technique.. great idea! This is a really great technique...What happend to the rest of the polish you had in the bottle?? I really love this... I'll have to give it a try. I just discovered your blog.. it's amazing! AH BRILLIANT! So creative! =) I will have to try this soon!! Great job, Challenge buddy! Holy Crap this is freakin awesome! Plus I love the colors esp the green! awesome nails. love the idea. very cool. That is the greatest idea! I love the spatter look but was scared to try it. You have made it so simple now. Thank you! Gorgeous nails and I love your blog. Gahhh this is so freaking awesome!!! What an awesome idea! I must try this. I have to try this! 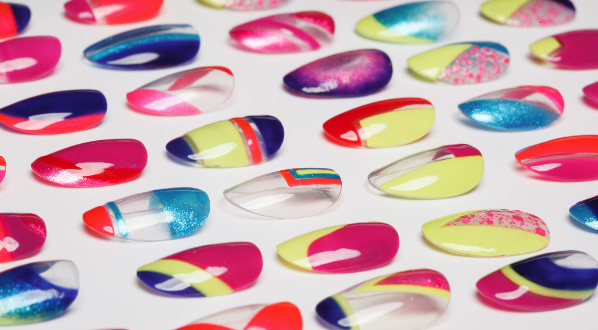 It seems like it would take a lot of the mess and polish inhaling out of splatter manicures! I just tried this and it is lifechanging ;) I wanted to try splatter, but hello! Mess galore. This was painless and used up a franken I made that wasn't quite up to par. Thanks for sharing! what kind of thinner? 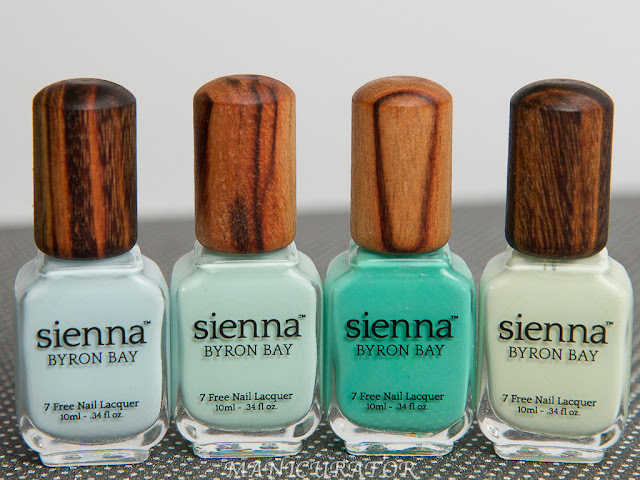 is there a nail polish thinner? I am on my third time trying this... my spray bottles don't seem to want to work... :(( on to trying again....... yours looks amazing ..
Oooh, I'm so trying this ASAP. Where do you get the thinner?? I saw a link for this on Lydias Nails and all I can say is WOW!! I know I'm a little late on this one but this is awesome!! !